It’s My Party…. | What a Beautiful Mess! ….and I’ll wear great party props if I want to! I know it’s in the third week of the month, but there’s still time to grab the MIX Event item from Bokeh! 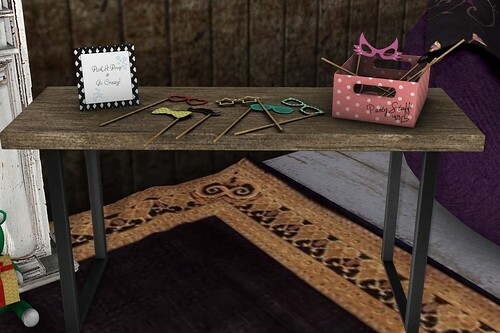 This month it’s the Party Prop Table with wearable party props for anyone on touch and three textures for table and picture frame. You can drag and drop your own texture into the frame for your own message! There are all kinds of neat props including lips, glasses, masks and a moustache! The December round of the MIX Event ends December 31! Here’s a closer look at the table! Take a look at these socks!! They’re a limited edition group gift from !APHORISM!, with four texture options, and they just shout cozy night at home! The December hair is an exclusive from KoKoLoReS at Hair O Logy! This is from HUD 1.
.::WoW Skins::. has Myst available at the current round of Designer Circle. This is in Milk tone. I went way back in my files and found the Morgan Flannel top from SN@TCH! It’s so comfy and cozy!